ANTHE Admit Card has been released by the Aakash Institute. ANTHE exam will be held on 28 October 2018. ANTHE 2018 will be held in both Computer-based and Pen and Paper based mode. It will be conducted in the English Language only. The link to download the aakash admit card is available on this page. Candidates who will submit their duly filled ANTHE application form before the due date will be able to download the Aakash institute admit card. The applicants should know that the Aakash ANTHE Admit Card will not be dispatched through Post. Hence, they have to download it through online only. 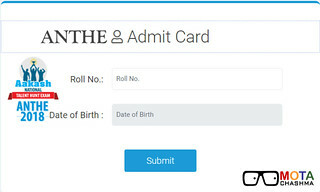 ANTHE Admit Card 2018 contains the name, photograph, signature; the address of the test centre allotted and test date & time and category and Father's Name of the candidate. Scroll down to read more about ANTHE Admit Card 2018 Download and things to do on the ANTHE Exam Day. Latest Update: ANTHE 2018 Exam Date has been released. The registration has started. ANTHE Admit Card has been released. ANTHE Admit Card 2018 is available to download for the ANTHE Exam. The admit card can only be downloaded by those eligible candidates who will submit their duly filled application forms before the deadline. 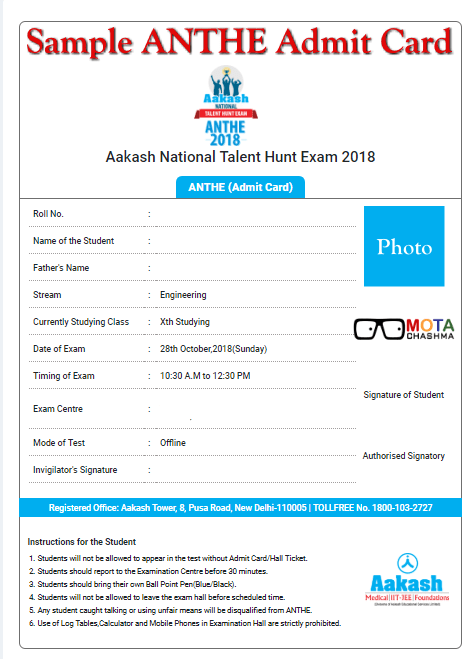 After downloading the Aakash admit card, the candidates have to verify the details such as name, photograph, signature, the address of the test centre allotted and test date & time is given on the ANTHE Admit Card 2018. Many students are writing that they have either deleted the ANTHE Roll Number or have not received it. All those students who have successfully made the payment for the exam will receive the roll number on their registered mobile number and also on the email address. You should go and check that. There will be no ANTHE Junior of ANTHE Senior Exam to be conducted for this time, However, There will be a single ANTHE Exam for the candidates. The candidates are required to go through the ANTHE Syllabus 2018 given below for the students of Class 8, 9 and 10. ANTHE Preparation Tips will be useful for students to ace the ANTHE scholarship exam. Chemistry: Matter in our Surroundings, Is Matter Around Us Pure? Biology: Class 10 – Life Processes- Nutrition, Respiration, Transportation, Excretion; Control and Coordination in Animals and Plants, How do Organisms Reproduce? Mental Ability: Verbal & Non-Verbal Reasoning – Series, Analogy, Classification, Coding and Decoding, General Logical and Analytical Reasoning, Problems based on Figures, Data Interpretation. In a case of any queries related to ANTHE Admit Card 2018, you can write to us in the comment section below.